simply carved, the stolid beast with two horns shown recumbent with legs held close to its sides, the base polished flat for use as a weight. 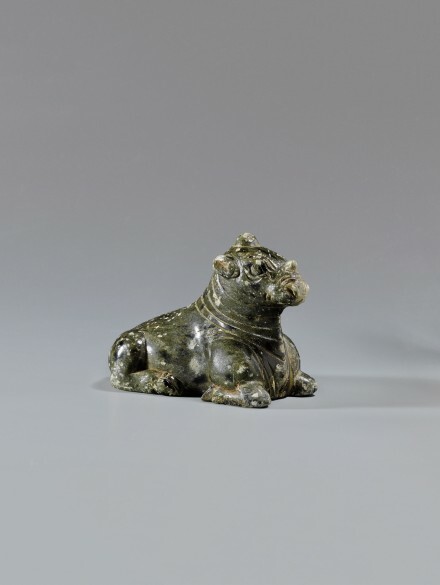 The rhinoceros is a rare image in the arts of the Tang dynasty, but two-horned rhinoceros are recorded as surviving in the wild in the Lingnan region of Southern China during the Tang period. A parcel-gilt silver box from the Hejiacun hoard incised with a rhinoceros in a medallion on the cover is illustrated in Selected Treasures of the Shaanxi History Museum, Xi’an, 2003, p. 106, pl. 102B and two parcel-gilt silver bowls, each decorated in respoussé with a rhinoceros, are illustrated by Gyllensvärd in Chinese Gold, Silver and Porcelain: The Kempe Collection, New York, 1971, p. 58, no. 59. A Tang dynasty sancai-glazed pottery pillow with a similarly modelled recumbent rhinoceros forming the support, excavated in Yangzhou, Henan province is illustrated in Wenwu Tiandi, Beijing, 1989, No. 4, p. 47.